Beat the chill with Nicky's stylish Murray Cowl. This month we introduce our fabulous new columnist Emma Escott from LuLu Loves, Nicki Trench joins us with tales from her Sussex studio and we discover faery magic with Stephanie Dosen. 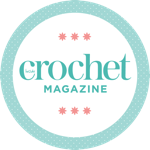 Our new columnist makes exciting crochet plans for the year ahead – but who is it?